The International Women's Health Coalition was pleased to be the convenor and host of the first Christopher Tietze International Symposium, held in Berlin in September 1985. 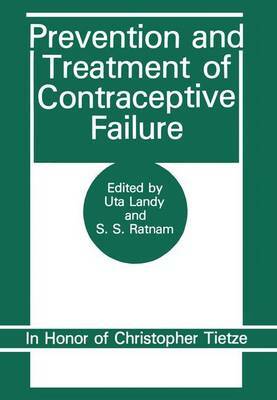 The papers in this volume represent a wide range of international views and experience with the prevention and treatment of contraceptive failure. We believe the issues discussed at the Tietze Symposium to be of interest and concern to women throughout the world and to those who would serve them. The Coalition intends to l1'ive broad distribution to this volume and encourages those interested in these issues to be in touch with the Coalition in New York City (see address below). We would like to thank The Ford Foundation, Stewart Mott, The David and Lucile Packard Foundation, the Population Crisis Committee, and The Uockefeller Foundation for their support of this Symposium. In particular we would like to express our appreciation to Sarah Lewit Tietze and Uta Landy for the devotion ann dedication which made this Symposium possible and a worthy memorial to Christopher Tietze.